Wondering what is the right age to take your child to the dentist for the first time? According to The American Dental Association and the American Academy of Pediatric Dentistry, it is recommend that a child’s first visit to the dentist should be when the first tooth erupts in the mouth, and no later than age one to two. As decay in baby teeth increases the risk of decay in permanent teeth, so it is paramount to start your son or daughter off on the right path with respect to dental health and hygiene. Prior to the first trip to the dentist, you should consult with your dentist about a kids’ friendly dentist; that is one that practices in pediatric dentistry. You may also find out if your current dentist’s practice is kid-friendly. After this, you should make an appointment to tour the office with your child and to familiarize them with the new surroundings. Be sure to keep an eye out for cleanliness, as all the tools should be sanitized and wrapped in plastic. 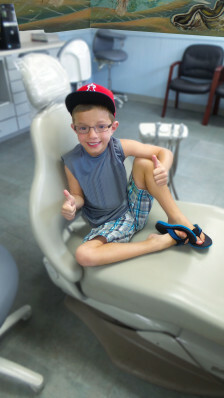 The first visit essentially familiarized your son or daughter with the dentist office environment. This fosters the building of trust, and eliminates any ill-feelings towards going to the dentist. Additionally, it allows the dentist to do a quick examination of your child’s teeth. They will check for any signs of tooth decay, check gums, jaw and bite. During the first appointment, make sure that your child feels comfortable. Assure your child that they are safe, and explain what each tools do. Per the dentists’ office policies, your child may be able to sit on your lap during their first visit to ensure that they feel comfortable. You dentist will most likely demonstrate with oversize toothbrushes the facts of keeping teeth clean. Finally, your dentist will then check your child’s teeth and will also check for bottle caries, frenum issues, or other problems that may affect your child’s teeth or speech. During this visit, the dentist will also want to talk to you about the importance of good oral hygiene and allow you to ask any questions or concerns that you may have. After the first appointment, your dentist office will advise you on the next appointment. 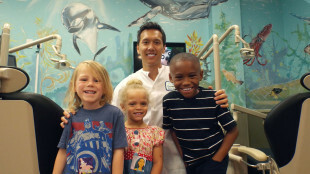 From this point forward, children should come in every six months for dental checkups. By the time the child is three, he or she will have full dental appointments. And at roughly age five, x-rays will be taken. Great Expressions Dental Centers have 270 dental offices nationwide with dental professionals that specialize in pediatric dentistry. Learn more here, and contact your local Great Expressions Dental Center to schedule an appointment for your son or daughter today.